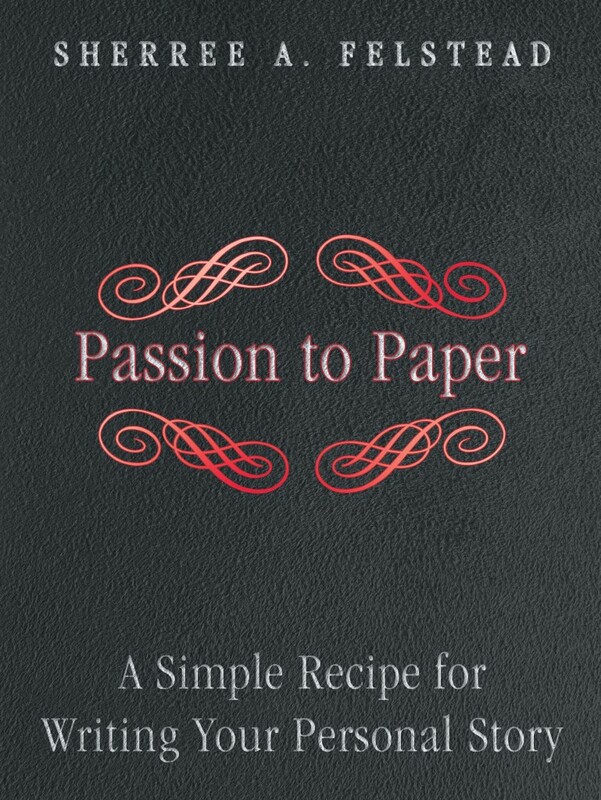 This week’s newsletter giveaway is copy of Passion to Paper by Sherree A. Felstead. To enter your name in the contest, follow the instructions in this week’s newsletter. 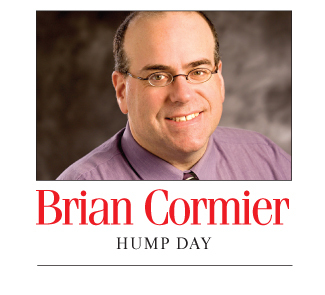 To subscribe, please fill out the form in the right-hand column of my website. The deadline for entries is Sunday, May 4, at noon. The winner will be chosen by random draw. Congratulations to last week’s winner, Sarah Murphy, who won a signed copy of The Thank You Economy by Gary Vaynerchuk. UPDATE: The winner of Passion to Paper is Ana Watts. Congratulations! The Greater Moncton Sewerage Commission (GMSC) is opening its composting facility at 399 Delong Drive in Moncton to the public for the 2014 gardening season beginning on Monday, April 28. Please note that the site will be closed on statutory holidays: May 19, July 1, August 4, September 1 and October 13, 2014. Information on the GMSC’s compost product and site hours of operation can be obtained directly from its website or by contacting the compost facility directly at 875-7307 or 387-6884. I have a YouTube channel and have uploaded a number of videos. Some are weather related. Some are pet related. I even posted a recipe. There are also uploads of old family movies that I had converted digitally from 8mm film. The recipe video has done quite well, as have a few others, but one in particular went viral as soon as I uploaded it on June 15, 2010, and in the past week has gained nearly one million views thanks to some good luck not of my own doing! Yes, one million! By the time you read this, it will likely have surpassed the 1.5 million mark. 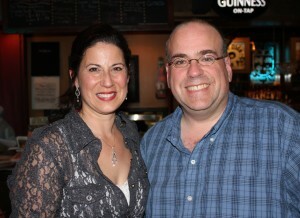 My cousin Kelley Mooney is a talented singer who fronts a couple of bands on P.E.I. where she lives in Charlottetown with her husband. She had come out with a cassette (yes, a cassette) years ago, but decided to release a CD in 2011. Over the years, she’s played a few times in Moncton, once at the old church in Beaumont during a summer concert series, once at the Moncton Press Club opening for Catherine MacLellan, and, of course, there was her incredible performance of her spiritual lyrical adaptation of Leonard Cohen’s Hallelujah which she performed with Monette Gould’s Chorale Voce dell’Anima choir on June 1, 2010, at the Monument Lefebvre in Memramcook. How Kelley’s version came about is that she was asked by her parish priest in Iona, P.E.I., to sing Hallelujah one year during Easter mass. Now, it should be said that just because a song has the word ‘hallelujah’ in it doesn’t mean it’s suitable for church. This was the case this time, because when Kelley read the lyrics more closely, she was quite certain that the modern song didn’t belong in Easter Sunday mass. With that said, wanting to please the priest, she got to work adapting the song to the Easter message, keeping the tune but changing the words to a much more religious meaning that was directly related to Easter. I decided on the day of her Memramcook performance that I’d record it for posterity. In the back of my mind, I thought maybe it would go viral. Mind you, I had no idea if it really would, but I thought I’d try, at least. After looking around town for a new high-definition video camera, I decided that my ‘terrible little digital camera’ (as it is now known) would have to do. Even in 2010, technology was very expensive. Since then, prices have come down, but I nearly spent $1,000 just to properly record the performance, hence the decision to go with what I already owned. I came to my senses, though, and proceeded to record the performance by simply holding my ‘terrible little digital camera’and pointing at the stage in the darkened room. My hands were shaking a bit because of the angle at which I had to hold the camera. If you’ve seen the video, that’s why the video quality is not great. To say the least, the performance went well. Kelley got an immediate standing ovation and the crowd went wild with applause and cheering. It was one of those magical musical moments. You just had to be there. I decided then and there after seeing the crowd’s reaction that I’d be uploading the performance to YouTube. Let’s try this out! But first, I had to get permission from Kelley and Monette. Both agreed immediately, but Monette insisted on having the professionally recorded soundtrack replace the soundtrack that would have been recorded on my ‘terrible little digital camera.’ I shake my head, because at the time I thought she was being a bit silly. But I listened to her and took her advice. I should have never questioned her wisdom. Monette knew what she was doing. Never doubt a pro! The sound technician working at the concert that evening was kind enough to replace my recording’s low-quality mono soundtrack with the professionally recorded version – the one you hear on the video if you watch it. Needless to say, it sounded amazing. Without that soundtrack, the video would have certainly been relegated to the trash heap of banal YouTube videos that are a dime a dozen. The star of the video is the soundtrack. It certainly wasn’t the grainy video footage itself. When it hit YouTube, it started to gain in popularity as people watched and shared. Over the years, it would climb in views thanks to people sharing it on social media, such as Facebook and Twitter, or simply emailing the link to friends and family. A couple of weeks before Easter this year, the video had reached 520,000 views. Not bad for a video recorded locally! But the Internet is a funny thing. If just the right website shares something, a video can have a second viral life. When GodTube.com posted the video on April 15, the video exploded in views, earning nearly one million more views in seven days. Since then, Kelley’s been inundated with emails and requests for the lyrics from around the world. When I was sitting in my chair in the auditorium on that June night in 2010, holding my so-called ‘terrible little camera’and recording Kelley and the choir, I never guessed how the video would do. I learned a lesson that day: sometimes you just have to go with your gut feeling in life, trust your intuition and hope for a little help along the way. And that, my friends, gets a big old “Hallelujah!” from me! Greater Moncton residents will now have an easier and more convenient way to recycle their empty beverage containers. That’s the idea behind (re), a unique pilot project being tested in the Greater Moncton area aimed at revolutionizing beverage container recycling. At the new drop-off self-serve re-centres, busy consumers can recycle their empty beverage containers at their convenience – with the entire process taking less than one minute. 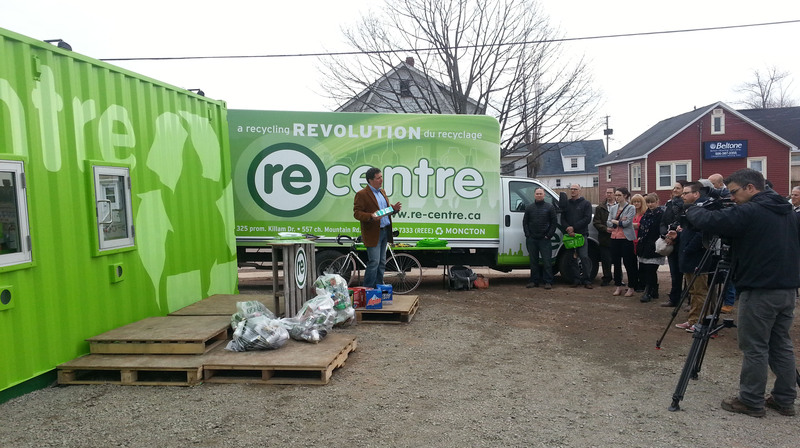 The new re-centres were launched today with a news conference and inaugural first bag drop of recyclable containers. Consumers who want to use the new re-centres need to register online at www.re-centre.ca in order to get a card linked to their account. Consumers can then collect their empty beverage containers, drop them off at their convenience at an unmanned self-serve re-centre unit and receive their New Brunswick deposit-bearing beverage container refund via an online payment system. Behind the scenes, the (re) team collects and sorts the containers daily, confirming accurate container counts and crediting consumers’ accounts with the appropriate refunds. The two unmanned solar-powered/off-the-grid re-centres are accessible to the public at 557 Mountain Road and 325 Killam Drive in Moncton. They are open seven days per week from 7 a.m. to 10 p.m. The (re) pilot-project is an initiative being lead by New Brunswick non-alcoholic beverage product distributors and managed through Encorp Atlantic Inc. which provides post-consumer beverage container management services to organizations that distribute deposit-bearing beverage containers in New Brunswick. Now representing more than 85 distributors of non-alcoholic beverage products in New Brunswick, Encorp Atlantic is proud to be a leader in industry stewardship, proud of the more than $100 million contributed to the Government of New Brunswick’s Environmental Trust Fund, and proud of the three billion containers recycled since 1992.
online registration launched today, and participants will be able to start bringing their empty beverage containers to the re-centres as of June 1, 2014. Representatives will also be promoting recycling and recruiting participants at the Earth Day Moncton event on Sunday, April 27, as well as throughout the summer months at the Moncton Market and at numerous festivals and events. For more information, contact Pierre Landry at 506-389-7320 or pierre@encorpatl.ca. 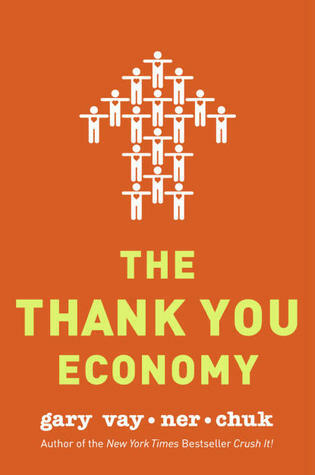 This week’s giveaway is a copy of The Thank You Economy by Gay Vaynerchuk. To enter your name in the contest, follow the instructions in this week’s newsletter. To subscribe, please fill out the form in the right-hand column of my website. The deadline for entries is Sunday, April 27, at noon. The winner will be chosen by random draw. Congratulations to last week’s winner, Lisa Breau, who won a signed copy of Reinventing You by Dorie Clark.